Temporarily out of stock. Restocks this week. 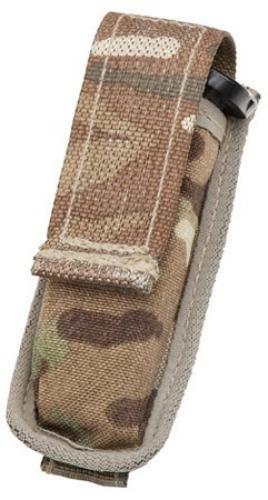 A single pistol mag pouch in MTP camo. 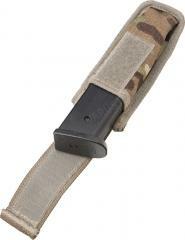 Part of the British Osprey system, which is totally MOLLE compatible. Made of Cordura, treated with waterproof coating on the inside. Being used, the coating might not be 100% perfect. It's an open pouch anyway. Dimensions about 5 x 13,5 x 3 cm. Hintaansa nähden erittäin käyttökelpoinen tasku, sopii hyvin glockin lippaille! I bought 4 of these...one came a bit dirty but all were in excellent shape...the flap has a Velcro closure that holds tight...I thought they were bigger (didn't look at the size on these) but no worries, They fit my NiteNumen NE01 18650 flashlight snug but perfect. they fit my Leatherman SuperTool 300 perfect...and that's all i really wanted them to do...the snaps on the MOLLE straps are one-way snaps...so they are hard to snap open by accident, but when you want to open them they work with ease...all and all, an excellent piece of surplus gear.